Windows stores user names and passwords on your PC so when you try to log on to network shares, websites (Windows Integrated Authentication) or Remote Desktop Connections, you don’t have to reenter the login information. Caching logins can be helpful if users have multiple usernames and passwords for different programs and can also speed login times for users. 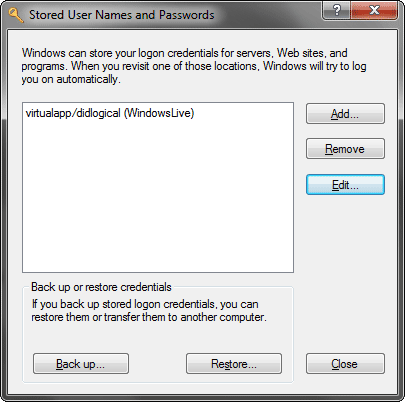 However, by storing passwords, Windows also makes it possible for an unauthorized person to walk up to the computer and use the stored passwords to access the protected programs. I recommend checking which passwords Windows has already stored and delete those that pose a high security risk. Here’s the method to remove stored Windows network passwords. How to Remove Stored Network Passwords in Windows 7? You can access the Windows Vault through the Credential Manager. The easiest way is by just typing “Credential Manager” in the Windows 7 Start Menu search prompt. You can also access the Credential Manager through the Control Panel: -> User Accounts -> User Accounts. The link to the Credential Manager can be found in the left navigation bar. You can remove an entry by selecting it from the list and clicking Remove. How to Remove Stored Network Passwords in Windows Vista? To access Stored Usernames and Passwords, you have to run “control userpasswords2” from the command prompt, then click on Advanced, and then on Manage Passwords. You can also launch the tool via the Control Panel: User Accounts -> User Accounts, and then click on “Manage your network passwords” in the left navigation bar. How to Remove Stored Network Passwords in Windows XP? In Windows XP, to access Stored Usernames and Passwords, you have to run “control userpasswords2” from the command prompt, then click on Advanced, and then on Manage Passwords. You can also launch the tool by running “rundll32.exe keymgr.dll, KRShowKeyMgr” from the command prompt. Next Post: Forgot Admin Password for Windows 7 64-bit PC? Next Entry Forgot Admin Password for Windows 7 64-bit PC?